Ladies, I am SO excited about this Esmara line By Heidi Klum! This collection is EVERYTHING. From going out to a casual lunch to dazzling at a New Year’s Eve party! So, this blog post is going to be a bit longer than my usual posts, but bear with me, because this line is for everyone and the prices are amazing! Let’s start with Everyday Wear. Take a look at this black cardigan ($14.99) below. I put together a couple outfits with this cardigan because you can stay super casual or easily dress it up a bit! The second way I decided to style this cardigan is with the same jeans and t-shirt, but I added a statement necklace and black booties. This outfit would be perfect for a casual business meeting, dinner or a date! If you’re always in a hurry like me, this is perfect, because it was a super simple transition to my second look for the evening. Without further ado, let’s get to the stuff that sparkles, shall we?! I got SO many compliments when I was wearing this outfit! The velvet top ($7.99) is SUPER soft and it goes perfectly with this midi sequin skirt ($12.99). Pair this with heels, booties or flats. You really can’t go wrong here! I’ve attached a photo below to show you all of the colors the velvet top comes in! Navy blue, dusty pink, black and red! Who is ready for even more sparkles?? ME! Below is a dress that is PERFECT for a NYE party, holiday party or a night out with the girls. It’s form fitting, but not super tight, so you can still cut some rug in it! This dress looks great with OR without leggings. I paired it with faux leather booties and a black clutch. THAT’S IT, and I was party ready! What’s even more amazing is that this dress is $19.99! C’mon now! 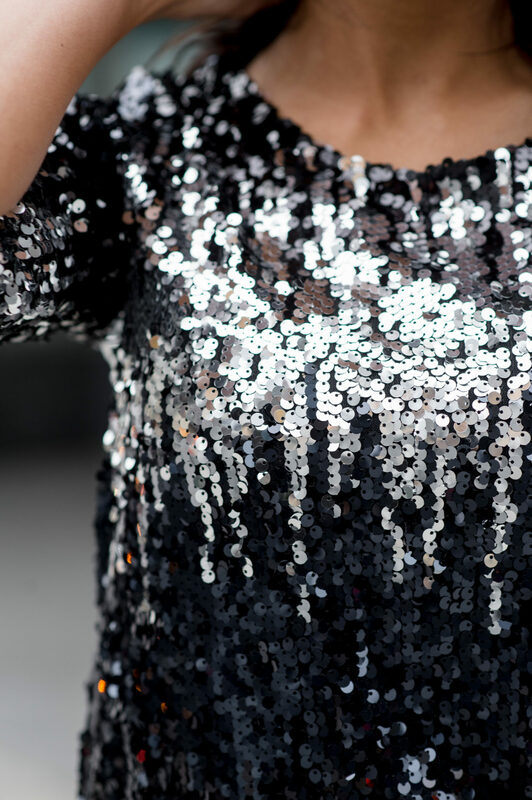 Where will you be wearing your sparkle dress? Trust me, wherever it is, you’re going to be a stunner! Also, be sure check out the winter wool blend coats! ($29.99!) They come in black with black OR beige trim! So pretty! This whole line is SO VERSATILE so I made a quick video to show you a few different ways you can mix and match the pieces! View below. I hope you enjoy the collection as much as I do and I am excited to see how you styled your outfits from Esmara By Heidi Klum. You can easily mix pieces from her first collection I blogged about with this Holiday collection. Make sure to head to their website HERE to check if there is a location near you. Follow along the fun & their new releases. Lidl Facebook – Instagram – Website! Tomorrow is December 1st which is MIND blowing. Time is flying by and that means less time for you to figure out what to wear to all the Holiday parties and events coming up. Luckily, I’m here to share yet again another favorite outfit of mine with you. Below I have styled one of the newest jumpsuits from Esmara by Heidi Klum!! This line will hit in Lidl stores on December 7th! One week from today. I took a plain black jumpsuit, added the faux fur stole that is also from Esmara tied it around my shoulder to totally change the look and feel of this jumpsuit. The faux fur also comes in blush. It’s only $9.99!! I’m all about finding staple pieces for my closet that I can easily add some flashy accessories to and be ready to go! A great thing about this jumpsuit is you can easily put on a denim jacket and rock a pair of sneakers too. Each piece of the new Let’s Celebrate collection can be worn in so many different way. Can you believe this jumpsuit is only $14.99?!? You can get the jumpsuit and fax fur stole for under $30!! The second jumpsuit it sleeveless and I will be sharing that and more looks soon on the blog and on my social media. Keep your eye out on my channels and if you’re near a Lidl make sure you mark your calendar for this launch. Her items sell out so quickly! You can do an entire outfit for under $50. You can’t do that very much these days. If you have any questions on sizing or outfit pairings, feel free to send me a message. I would be glad to help you put together a Holiday outfit. If you’re local to Manasas, VA I will be at that Lidl location December 7th when the doors open for the big reveal. Come meet me and get your Holiday outfit needs done! This post is sponsored by Lidl, all thoughts, opinions and my love for fashion is my own. Heidi Klum is back with Esmara for Lidl and this second collection made my heart skip a beat. You add sequins, velvet, sparkles and faux fur to an affordable price tag and I’m going IN!!! I can’t get enough of this collection. I wanted to wear everything and share everything in one day with you guys. There are so many amazing pieces that I will she showcasing throughout the next month, so keep your eyes on my blog and social media channels. This collection hits Lidl locations on December 7th and will sell out quick!! You can view her first collection by clicking HERE, also search to see if their is a Lidl near you by clicking HERE. I’m a sucker for a staple piece sweater that you can wear with jeans when out and about during the day, sweats when you’re at home relaxing or running errands and even adding a skirt for a night out on the town. Also a huge fan of when the sweater is only $14.99!! Yep, that’s right. Above you can just image how soft that sweater is, trust me– you need one! Comes in sizes 2-12. I’m wearing a size 4. Another favorite piece of this collection is the jumpsuit! There are two different options that she is releasing, the other one I will showcase in a later post. It’s also under $20! It’s $14.99!!! Comes in “One Size” – I’m usually a size 4 and this fit me. I added a fun faux fur stole as an accessory to this outfit! It comes in light pink and black. You can adjust how tight or loose you’d like it to be, you’ll see below a photo of how it ties. I’m wearing a size 4 and is only $9.99!! A great item to add to a plain t-shirt, dress or jumpsuit like I did. Sky is the limit for how you can use this accessory in your daily outfits. Heidi designed some GORGEOUS camisoles! Comes in 4 different colors and even 1 velvet. Since the weather here in Virginia has been getting chilly, I added a plain white t-shirt under mine. Add some fun accessories and you’re ready to go. I went with a black chocker to vibe into my 90’s look. Anyone else love how fashion trends are coming back? I know I do!! Sizes 2-12. I’m wearing a size 4. Only $5.99! She designed another 3 pairs of jeans/pants for this collection and yet again — perfect fit! I’m wearing a size 6 in these. They come in Black, black faux jean/leather look and dark denim. For only $9.99 you could get multiple pairs — I know I went back to the store and bought 2 more pairs for later. When I love something, I buy it in every color and multiples — no shame here!! This clutch is from her first collection and is one of my favorites, I use it all the time! I love how easy it is to take her pieces and mix -n- match them. You have total control on taking any staple piece from her collections and making it into your own fashion statement or a day to day piece for work or event! I hope you enjoyed some of my styling ideas for her new collection. I also hope to see you at the Manassas Lidl location on Dec. 7th! I will be there helping you style the new collection.